The fragmented populations of African elephants living in sub-Saharan Africa are classified as vulnerable. As of 2002, the African Elephant Database had confirmed 400,000 living elephants, with another 200,000 speculated but not confirmed. 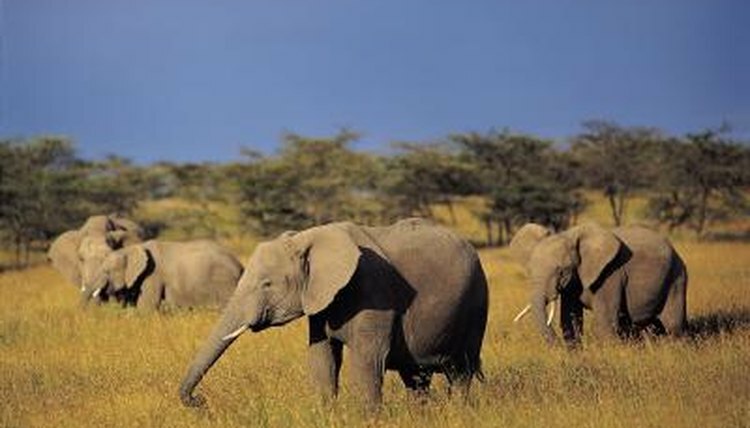 The largest living land mammal, the elephant is an herbivore that migrates to find grass and water. Habitat loss, ivory poaching and other conflicts with humans are the greatest threat to the African elephant’s continued survival. For 200 years, hunting the elephant for its prized ivory tusks has been a major factor in the decline of the animal’s populations. In 1989, African elephants were listed in Appendix I of the Convention on International Trade in Endangered Species of Wild Fauna and Flora, effectively banning the trade of elephant products in international commerce. However, political instability in elephant-populated countries inhibits enforcement of the treaty. In July 2000, the World Wildlife Fund began a program to train surveillance teams and anti-poaching patrols to help protect elephants. Diplomatic campaigns from the African Elephant Specialist Group target the citizens of consumer countries in an attempt to decrease demand for elephant products. Increasing competition for land resources causes local populations to have a negative view of elephants. In 1997, the Human-Elephant Conflict Working Group was established to develop mutually beneficial strategies so people and elephants could coexist in areas with finite resources. The group also provides advice and expertise to African national governments. In some areas, monetary compensation is given to farmers whose crops are trampled or eaten by elephants. In other areas, physical barriers -- including trenches, electric fences and spotlights -- keep elephants away from human settlements. Although elephants live in wildlife refuges and other protected areas, their extensive migrations mean as much as 80 percent of their range exists in unprotected areas. Political instability and socio-economic challenges prevent many governments from maintaining conservation parks and institutions. Non-governmental institutions work with affected human populations to develop plans that move crops away from the fringes of elephant habitats. Corridors connecting fragmented habitats and populations help ensure the elephant’s continued survival while protecting human settlement. More research and understanding of African elephant movement and behavior is needed to develop effective conservation strategies. In 1986 the African Elephant Specialist Group established the African Elephant Database to collect field data and provide information about elephant populations and distribution that's as comprehensive and detailed as possible. Modern technology, including GPS and satellite tracking, are used to monitor elephant movement. This is particularly important since elephants move without regard to national political boundaries. Zoos throughout the world also participate in public education, research and captive breeding programs necessary for the conservation and continued survival of the species. What Is Being Done to Stop the Rhino from Becoming Extinct?